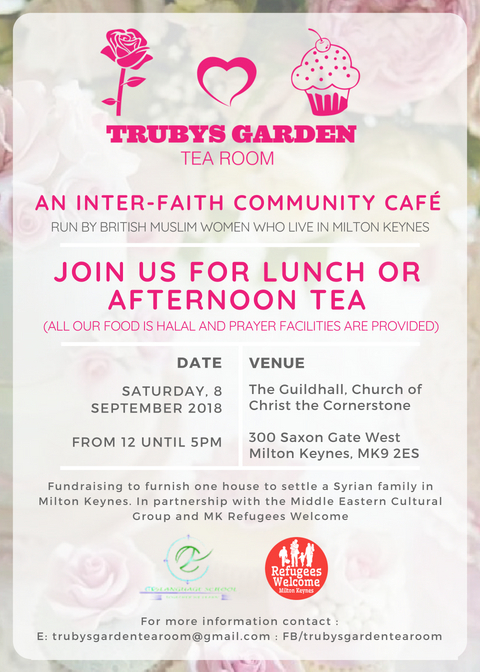 Trubys Garden Tea Room will be popping up on Saturday, 8 September, 12.00 – 17.00 at the Guildhall, Church of Christ the Cornerstone, 300 Saxon Gate West, MK9 2ES. We will be kick starting the event with Trubys AGM at 11.15 – all welcome to attend. The cafe will be open from 12.00 noon as usual. 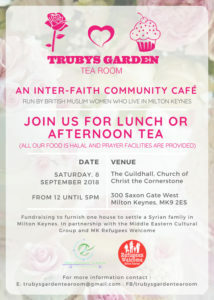 This is our big push to raise the rest of our £3k towards the one house project to settle Syrian families in Milton Keynes so please support us by attending, promoting and encouraging others to attend.